The Texas Water Safari is an Unlimited Race. All teams are racing for overall position. All Classes, except Unlimited, are awarded trophies for only the first boat to Seadrift in that Class. Trophies are awarded to positions One (1) through 15 and all other finishers receive a finishers plaque. All finishers receive a patch. i. Only human muscle powered propulsion of boats will be permitted. ii. 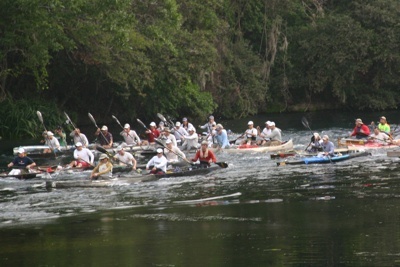 Canoes must have adequate flotation to float the canoe. iii. Canoes must have a white light for night travel. 1. The designated boat number shall be affixed to both sides of the bow of their boat. 2. The designated boat number shall be at least 4" in height and shall be composed of up to four Arabic numerals without leading zeros. 3. Boat numbers must be made of reflective material and must be a contrasting color from the boat. * Class may be combined with another class.